This image shows the pattern Man in Sampan printed on the opposite side of the pot. 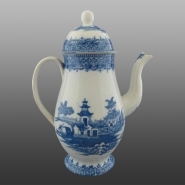 An early Swansea pearlware coffee or chocolate pot printed in two Chinoiserie patterns: On the side shown here is the Tall Lantern Carrier pattern and, on the other side (shown below), is the Man in Sampan pattern. The Polmesk Border pattern used on this example is only known to have been made by the Cambrian Pottery, thus attribution to the Swansea factory is made.